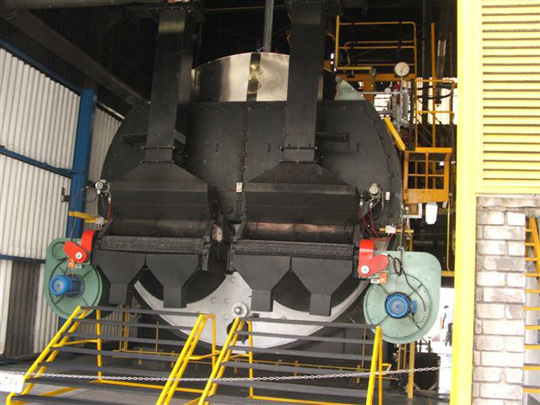 Combustion Automation aims at optimizing the cost of raising steam. Reduced Coal usage of 12% is common with this technology, and reductions in excess of 20% have been recorded. A reduced Mechanical wear of Fans and Motors. Substantially reduced noise levels in the Boiler House. Little opportunity for Operators to tamper with sensitive combustion settings: these are securely hidden behind passwords to which the Supervisor and Engineer only has access. Accurate modulating control of the Steam raising process, whilst frequency inverters driving the Fan and Stoker Motors add to the integrity of control and significantly reduce the use of electricity. Users have a choice of optional controls and devices, including soft starters for feed pumps, soot blowers, and blow down automation, stack temperature monitoring, gas analysis and oxygen trim control. steam flow metering, on-line boiler efficiency display, automatic TDS control, steam and water flow meters, date logging, remote boiler monitoring, SCADA, on-line data management, etc. For the small coal user with a limited budget we offer our Coal saving package, an efficiency enhancing, low cost alternative which includes a pic and re-uses the existing panel components. As part of our Service we undertake training of Boiler Operators in our combustion automation system and provide comprehensive operating and maintenance manuals with data sheets and wiring diagrams. AUTO GUILLOTINE control to optimize fire bed lengths and ash burnt off qualities. Will improve air/fuel ratios and efficiency levels. Improve reaction times under load swings. Temperature thermocouples feedback from grate rear end indicates and automates exact fire bed lengths. IN TWIN FLUE Boilers right and left flues has been synchronized to prevent floating causing uneven tube build up between furnace and efficiencies. REPLACING OF MODULATING valve systems with new trickle feed pump operations by using variable motor speed control preventing cold water shock. TOP AND BOTTOM boiler shell temperature feedback control preventing boiler stress in example with boiler cold start up. OUTLET GAS monitoring preventing stack loss and indicate tube build up temperatures. BOILER OUTPUT RATE indicates boiler performance and tube restriction conditions. Digital coal bed mm monitors. Furnace and steam pressure digital programmable/control.